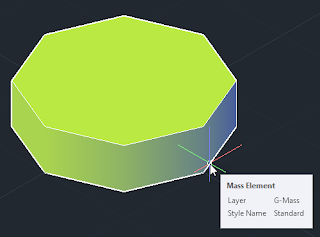 A thread in the AutoCAD® Architecture Forum last month brought to my attention that I have not yet addressed how AutoCAD Architecture handles "curved" Mass Elements. "Curved" is in quotation marks because AutoCAD Architecture does not display Mass Elements with true curves, but instead will approximate curves with a series of straight-line segments (2D) or facets (3D). In the image above, a Mass Element Cylinder with a radius of 10'-0" and a height of 5'-0" has been placed, with FacetDev set to 10'-0" to make the facets obvious. FacetDev is the allowable deviation of a facet from the true curve, and represents the maximum distance allowed from the midpoint of a facet, perpendicular to the true curve. Larger values will generate fewer facets. Smaller values will generate more facets. A full circle will never have less than eight segments, as seen in the image above. FacetDev must be a positive (non-zero, non-negative) value. Note: If imperial architectural units are set current, the command line will show the current value as a linear distance in those units (feet and inches), the value you enter needs to be a real number, without any feet or inchese symbols. For example, to set a value of 1'-0", type 12 and press the ENTER key. FacetMax sets a maximum number of facets for a single curve. For designs that feature curves with a wide range of radii, FacetMax allows setting FacetDev to a sufficiently small number to achieve a reasonable smoothness on the smaller radii without imposing a serious performance hit due to the large number of segments on the larger radii, which would look smooth with larger FacetDev value. Valid values for FacetMax are integers between 100 and 10000, inclusive. In the image below, I changed the Visual Style from Conceptual (used in previous image) and I set DISPSILH to 0, so that the lines between facets on the curved surface will show (rather than just displaying the silhouette), viewing the same Mass Element Cylinder as in the previous image. On the left side, FACETDEV remains set to 120 (or 10'-0"). On the right, FACETDEV has been set to 0.5 (or 1/2"). The first value is high enough to result in the minimum 8 facets. The second number results in a much higher number of facets, and is closer to a smooth curve. With DISPSILH reset back to 1, the image below shows the same cylinder in the 2D Wireframe (left) and Conceptual (right) Visual Styles.